Alfa Romeo & Agip. Yellow Service Sticker. 3". Alfa Romeo Chequered Style Helmet Visor Sunstrip Sticker. 12". Alfa Romeo Circular Logo White Text Sticker. 7.25". Alfa Romeo Circular Logo Window Sticker. 4" or 8". Alfa Romeo Colour Wheel Centre Stickers. Set of 4. 50mm. Alfa Romeo Cut Text Double Line Sticker. 12". Alfa Romeo Cut Text Single Line Sticker. 12". Alfa Romeo Document Holder/Toolbag. 10" or A4. Alfa Romeo Driver 2 Fingered Salute Sticker. 3.5". Alfa Romeo Gtv Cup Style Laser Cut Self Adhesive Car Badge. 7"
Alfa Romeo Headlamp Headlight Stickers. 5.5" or 6.5" Pair. Alfa Romeo Italia Tricolore Style Stickers. 2" Pair. Alfa Romeo Logo Nationality Country ID Plate Sticker. 5". 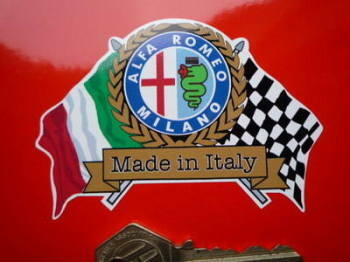 Alfa Romeo Logo Sticker. Black & Red. 3". Alfa Romeo Logo Stickers. Colour. 4" Pair. Alfa Romeo Martini Racing Triangle Sticker. 4". Alfa Romeo Milano Circular Stickers. 3" or 6" Pair. Alfa Romeo Milano Circular Stickers. Set of 4. 20mm. 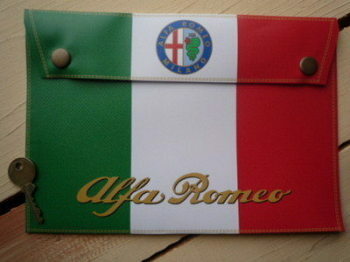 Alfa Romeo Milano Flag & Scroll Sticker. 3.75". Alfa Romeo Milano Garland Sticker. 6". Alfa Romeo Milano Later Logo Window Sticker. Colour. 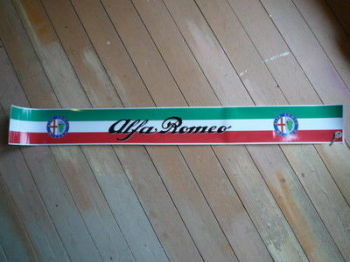 3"
Alfa Romeo Milano Old Logo Window Sticker. Colour. 3"
Alfa Romeo Milano Rusty Style Stickers. 4" Pair. 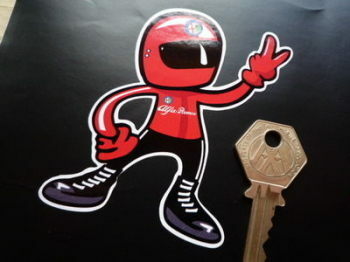 Alfa Romeo Milano Scuderia del Portello Shield Sticker. 3.5". Alfa Romeo Milano Scuderia del Portello Shield Style Wall Plaque. 5". Alfa Romeo Milano Sunstrip Screentop Decal. 52". Alfa Romeo Modern Logo & Stripes Sticker. 6". Alfa Romeo Modern Style Logo Stickers. 25mm. Set of 4. Alfa Romeo Modern Style Logo Stickers. 3" Pair. Alfa Romeo Monochrome Logo Stickers. 3" or 4" Pair.